Lena and Hillary talk student loan debt and Donna Karan dresses. Welcome to Lenny, an email newsletter from Lena Dunham and Jenni Konner that covers feminism, style, health, politics, friendship and everything else. As part of our first issue, Lena interviewed Hillary Clinton about how she went from being a "Goldwater Girl" Republican to a Democrat in college, her uncertainty about law school and marrying Bill, and her plans for ameliorating student loan debt for Millennials if she becomes President. Also in this issue: Lenny's collaboration with Planned Parenthood, Rumors I Heard About My Body, where questions about women's health are answered, a piece about the influence of designers Marques'Almeida on fast-fashion denim, an ode to the writer and architect June Jordan, and a personal essay about why queer marriage is important. If you like what you read, subscribe to Lenny here for more interviews, essays, and shorteralls in your inbox, twice a week. Lena Dunham: We're going to start early in your life. You went to college a Goldwater girl and emerged a staunch Democrat. Tell us a little bit about that transition. Hillary Clinton: In my household, my father was a conservative Republican, and my mother was a real social-justice Democrat. They used to cancel each other's votes out in every election. We had some amazing conversations, and arguments, around the dinner table. For the longest time, as a young girl, I thought that my father's views were really the ones I wanted to follow. I had some teachers, one in particular, who were very adamant about being conservative. So I worked for Barry Goldwater when he ran for president. I was a Goldwater girl, which meant I got to wear a cowboy hat, which I thought was really cool. Then I got to Wellesley, and I began to meet many different kinds of people, and we continued to talk about what we cared about and what we thought the country should be like and the world should be like. I found myself really evolving, moving toward a different set of beliefs. I think that's part of what your late teens and 20s are all about. You have to decide what you really believe. You can certainly carry with you some of the values that you've inherited, but you have to make them your own or you have to add or subtract from them. And that's what I did. We're all very curious at Lenny about what your passions outside of the political arena are. And we brought with us some very Instagram-worthy photographs of you during that time in your life. Oh my gosh! Look at that! Here, if you want to look at them, they might bring up some memories. I will! Oh, they do. Well, this is me at one of my favorite places in college, which was the lake that we had on campus. I just adored it. I would swim illegally every chance I got. It was just a real center for my experience in college. This is me and two of my friends, who were debating some of the issues of the day. We had lots and lots of vigorous debates back in those days. Civil rights, women's rights, the Vietnam War, the assassinations of Dr. King and Bobby Kennedy—the campus was often in turmoil because of things that were happening in the larger world. And we were talking here, as I recall, about what we needed to do to really address racism amongst us, which was something that people didn't want to necessarily believe, but we had to recognize we were part of a larger society. We had to do our part. Here, we were having a rally, as I recall, to do away with limited visiting hours by men. Yeah. Yeah. Curfews and visiting hours by men. That was what this was about. And you can see the crowd that it drew! These were people who really knew what they wanted. We were vigorously contesting the administration that wanted to keep doing things the way they had done them for a hundred years. So that counts as a nonpolitical interest. Well, it was a personal interest. But we had to go political to get them changed, and we did get them changed. Turning the personal into the political is sometimes the only way to stay true to the personal. So, so many of our Lenny readers are women in their 20s who are in that hazy space between college and the real world. They're not sure what they want to be, how they're going to be that. And we wondered how you felt when you graduated from college. For example, I worked at a children's clothing store, which I was terrible at. I read that you went and worked at a salmon cannery in Alaska, which sounded like a fairly post-collegiate move. I wondered what inspired that and whether you ever had that moment of indecision. Absolutely. I don't trust anybody who says that they didn't have some questions in their 20s. That's a period of such exploration and often torment in people's lives. And so, when I graduated from college, I had made the decision I was going to go to law school, but it was a hard decision. I wasn't quite sure that was exactly the right thing to do, but I thought I would give it a try. But first, I went off with some friends on this jaunt. We drove all the way up to Alaska, went up the then-unpaved Alcan Highway, and we took odd jobs. I washed dishes. I did end up working in a fishery, where the salmon were brought in, and we had different jobs. My first job was to gut the salmon. That meant that I had a pair of hip boots and a spoon, and there were some gentlemen from Japan who were experts in taking out the caviar. But then they would throw the carcass in the pile, and I had to take each one and clean out all that was left. I was trying to do a good job, so I was scraping and scraping, and they're screaming at me in Japanese, and somebody else is screaming at me in English. I didn't last long then. Then I was kicked upstairs to do packing, so I was packing the salmon. You had to pack head-tail, head-tail, head-tail. And I noticed that some of them didn't look really healthy to me. So I raised it with the guy who was running the plant. He said, "What do you care? They're gonna be shipped overseas! Nobody in America's gonna eat them." I said, "Well, I don't think that's right. We shouldn't be sending salmon that's gonna make anybody sick." He said, "Oh, just don't worry about it." Anyway, I go home that night, I go back the next day, and the whole operation has disappeared. Uh-huh. They disappeared. I guess they worried that some of us would have said something to someone. So I didn't get paid for that work. But it was called "sliming." That's what I started off doing. And I've often said it was a great experience for being in politics. You get the connection. To be a practitioner of sliming! Being a slimer, so to speak. Right? To be slimed, or slime. So, then I did go to law school. And it was a very tumultuous time. We had a lot of very serious concern in the school about what was happening in the world, and there were demonstrations of all kinds and protests. It was confusing. It was a tough time. And I met my future husband in law school. I started dating him, but I wasn't sure that that was the right decision. Because he was definitely going home to Arkansas. My 20s were very formative but by no means a clear path. I ended up after law school working for the Children's Defense Fund, which I loved. Marian Wright Edelman is one of my personal heroes. And then I went to work for the impeachment staff that was investigating Richard Nixon. Then when he resigned, I had to decide what to do, and that's when I took this big leap and said, "Okay, I'm gonna go try to find out what Arkansas is like and what it's like to live there." So I got a job teaching at the law school, and I just picked up and I moved to Fayetteville, Arkansas. When you married your husband, President Bill Clinton, I wondered whether you had any fear or anxiety. You were a woman with so many accomplishments and so many interests, and you were uniting with someone who was clearly headed toward the public eye in such a specific way. Did you have anxiety about that? About the concept of losing your own identity in the process of joining forces with someone who clearly had political ambitions? I was terrified about losing my identity and getting lost in the wake of Bill's force-of-nature personality. I actually turned him down twice when he asked me to marry him. That was a large part of the ambivalence and the worry that I wouldn't necessarily know who I was or what I could do if I got married to someone who was going to chart a path that he was incredibly clear about. My ideas were much more inchoate. I wasn't sure how to best harness my energies. So I was searching. When I taught at the law school, I set up a bigger legal-aid clinic. I sent students to represent prisoners. I did a lot of poverty cases. I loved doing that. And I wasn't quite sure how everything I cared about might fit into a marriage with him. So eventually, I said yes. It was a big leap of faith, and I think most marriages are. You really do just sort of say, "Okay, I think I know what it's gonna be like, but I don't know for sure. Let's find out." And it was great. We were both teaching at that time. He had run for office in 1974, but he lost. We got married in the living room of the house we had bought. I was excited about it but still somewhat apprehensive. Then he did get elected, to be attorney general, about a year after we were married. We moved from where we were living in Fayetteville, Arkansas, to Little Rock, Arkansas. And I switched gears to practice law instead of teach law. At every step along the way, I never could have predicted what I would have ended up doing. If somebody had said when I was 20 or 21, "Are you gonna marry somebody from Arkansas? And you're gonna teach law school at the university there, and you're gonna move there, and, you know, that's where your daughter's gonna be born …" It would have never been in my mind. It's just not something that I had ever imagined. So many of our Lenny readers are graduating [from college and graduate school] and want to move into jobs, into internships, start their own businesses, but are crippled by the amount of debt that they've accumulated. I wondered what you think that we can do about this college debt that follows so many people through their lives and makes it impossible for them to take career risks that they might have hoped for. It's one of our biggest problems, and I talk about it everywhere I go around the country. Here's what I want to do. We have $1.2 trillion in student debt, and this is an enormous problem. I want to give everybody a chance to refinance their debt. Bring the interest rates down, because oftentimes in crowds, I will say, "Who has student debt?" And so many hands go up. I'll say, "Does anybody have an interest rate of eight percent?" Hands stay up. "How about over eight percent?" I had a woman in Iowa the other day, 12 percent she's paying on her loans. I want to just compress those. Drop those. I want to get more young people with debt into programs where they pay a percentage of their income as opposed to a flat rate. That will make it a lot easier to save some money and not be so stretched all the time. And I want to put a time-certain deadline—that after 20 years, you don't have to keep paying it. Now, if you don't pay, and there's no good reason why you couldn't or didn't pay, it'll go longer. But for most kids who get out of school with this debt, they get into their working lives, they really try to do the right thing. They try to pay their debt down. But after a certain point, it's counterproductive. I've met young people that can't move out of their parents' homes. They have dreams to start their own business; they can't afford to do it. They can't even afford to get married. So we are not only squashing their hopes and dreams, we're hurting the economy. Because that money should be used for other things besides paying the government to try to retire your debt. This is one of my highest priorities. I'm talking about it everywhere, and I think it would make a big difference for a lot of the 40 million people who have student debt. I think the question on every Lenny reader's lips is: Do you consider yourself a feminist? Yes. Absolutely. I'm always a little bit puzzled when any woman, of whatever age but particularly a young woman, says something like, "Well, I believe in equal rights, but I'm not a feminist." Well, a feminist is by definition someone who believes in equal rights! I'm hoping that people will not be afraid to say—that doesn't mean you hate men. It doesn't mean that you want to separate out the world so that you're not part of ordinary life. That's not what it means at all! It just means that we believe women have the same rights as men, politically, culturally, socially, economically. That's what it means. And if you don't believe that about yourself as a woman, please, go ask yourself: Why? What is holding you back? And it's not going to be good for you as a woman to be denying the fact that you are entitled to equal rights. And so, yes, I'm a feminist, and I say it whenever I'm asked. Our first feature for Lenny was an interview with Chenai Okammor, who is a friend of Sandra Bland's, the woman who died under mysterious circumstances in prison in Texas. That was a story that really hit home with so many of our Lenny readers. So many young women of color—so many people of color—have suffered at the hands of police in the last few years. And I wonder, as president, what you will do to work on this kind of terrible fracture in race relations that we're experiencing in America right now. Well, it's very, very disheartening, because as somebody who did live through the civil-rights revolution, saw the legislation passed that really began to legally end Jim Crow, segregation—all the vestiges that we still live with, it's very discouraging. However, I will say what I think President Obama has eloquently said: we've made progress, but not nearly enough. And we can't continue to make progress if we're not even honest with ourselves that we still have problems. One of the areas where we have problems is the relationship between communities of color and the police forces who are to protect them. In those police forces now, we have many more police officers who are from different races, different backgrounds, so it's not only a question of white versus black. It is a question of how force is used, how our law enforcement are trained, what kind of mind-set they have as they go about their daily jobs. I think that President Obama's policing commission, which has issued a report, has some excellent suggestions. For example, after 9/11, we got really anxious to make sure we had homeland security everywhere. And a lot of military equipment was sold to police departments, and those police departments began to look like they were in a war zone, not protecting the family down the block or the neighborhood community center across town. That sent a very dangerous and threatening message. And also, I would add, it's important that communities recognize that most of the deaths in low-income communities, communities of color, are not due to police. They're due to crime and violence and, you know, terrible events that we read about in the paper. But the police have to be held to a higher standard. They are the representatives of our society. Also, a lot of the community policing, community dialogue that we started to have some years ago has sort of petered out. It doesn't happen like it used to. It needs to be constant. There needs to be a constant dialogue between communities and their police officers. And I think a lot of the training has gotten somewhat lax. I don't feel like police officers are being as well trained as they need to, to try to prevent problems, to try to make it possible to talk with people to end some of the incidents that are going on. I think their first reaction is one of anxiety and nervousness and they overreact. I think we have a lot of work to do. But I take it very seriously, and as president, I would do whatever I could to see what new laws were needed, what new training was needed, what new resources were needed. But ultimately this has to be between the community. They have to respect the police, and the police have to respect the community. Our last question is by far our most important question, which is that we need to ask you about this dress..
That is one of my favorite dresses, can I tell you? This is what's called a cold-shoulder dress. And I wore it for one of our first big events at the White House, in 1993. It was a design of my friend Donna Karan. And like everything I do, it turned out to be controversial. I'm hardly a fashion icon. I absolutely admit that. But I do love to fool around with fashion and have some fun with it. And so I wore this, and a lot of the political pundits [said]: "What is the meaning of this?" and everything. I thought it would be fun! You've got to still have fun in all of these different roles that you're in or I'm in or anybody is in their life. So this was one of my favorites. It's in the Clinton library, if anybody ever wants to see it. It's extremely chic. I think you should bust it back out. Do you think I should? Do you think I should try to get back into it? I think so. I do. Yeah! It's back. It's circled back. Well, you know, Donna always says that no matter your age, your size, your shoulders always look good. We don't have a problem here! Don't you think we ought to be working on this? I think we should do more shoulder stuff. Let's do more shoulder stuff! I am really motivated, my friend. This is exciting. Madam Secretary, thank you so much. We value your shoulder stuff. Thank you! Let's do it together! Lenny is an email newsletter founded by Lena Dunham and Jenni Konner, the creators of HBO's Girls. Subscribe now at lennyletter.com. 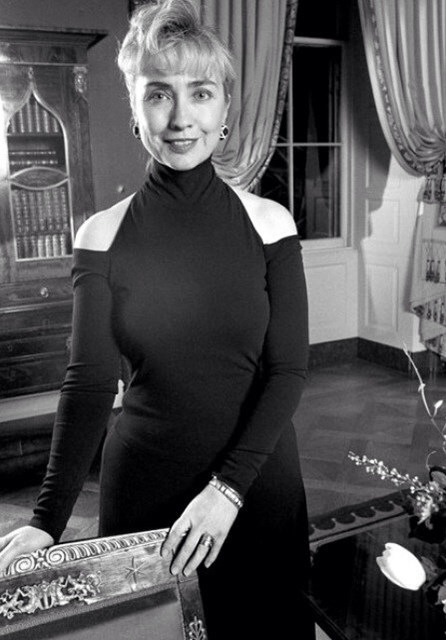 Can Hillary Clinton Keep It Cool?